We’d love your help. Let us know what’s wrong with this preview of DMZ by Rick Chesler. AN IMPULSIVE DECISION AT THE WORLD’S MOST DANGEROUS BORDER. A THRIVING WILDERNESS SHELTERING A PREHISTORIC SECRET. Six friends on a tourist trip to the Korean DMZ have their lives changed forever when they decide to step into a no-man’s land. But they soon discover that a border is not the only line they’ve crossed. A revealed secret between them causes bad blood to spill AN IMPULSIVE DECISION AT THE WORLD’S MOST DANGEROUS BORDER. A revealed secret between them causes bad blood to spill over, preventing the friends from cooperating. With the specter of capture by a totalitarian regime awaiting them should they stray too far off course, and with a pack of primordial predators roaming the woods, the wayward travelers must find a way to set aside their differences if they are to avoid becoming either political prisoners… or prey. To ask other readers questions about DMZ, please sign up. This was an intense read. I liked how the point of view switched between Paige and Kevin throughout the story. I found myself dreading hearing the sounds of the dinosaurs, and knowing that they were coming back for more. Rick Chesler always delivers a fast-paced adventure, and this one certainly qualifies. 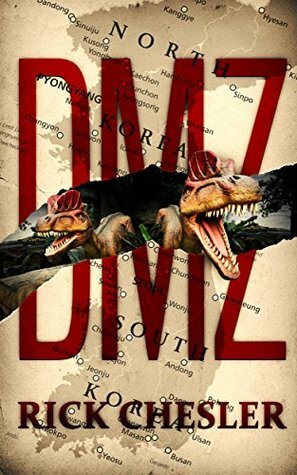 Dinosaurs and the dmz zone in korea. What could possibly go wrong. I didn't want to put it down. I just had to find out what was next. Crazy... Lots of action and adventure. I had a bad feelingly when I picked up this book that did not go away as I read it. Got half way thru and skipped to the end. Did not expect a good ending g as was not disappointed. Great adventure, told in an interesting way. Fairly realistic as to what would actually happen in such a scenario, which was also a nice change of pace. Author of over 30 novels, Rick Chesler holds a Bachelor of Science in marine biology and can often be found diving, boating or traveling to research his next thriller idea. A former contractor for the U.S. Deptartment of Commerce and the State of Hawaii, he now lives in South Florida with his family, at the edge of the Bermuda Triangle. Visit him online at twitter.com/rickchesler, facebook.com/ric Author of over 30 novels, Rick Chesler holds a Bachelor of Science in marine biology and can often be found diving, boating or traveling to research his next thriller idea. A former contractor for the U.S. Deptartment of Commerce and the State of Hawaii, he now lives in South Florida with his family, at the edge of the Bermuda Triangle. Visit him online at twitter.com/rickchesler, facebook.com/rickchesler, or rickchesler.com.